In this pilgrimage through church history, Joseph Kelly provides a colorful, graphic representation of the events and people of the Roman Catholic Church and puts in hand a wealth of historical information in a clear, easy-to-access format. Adults and young adults will find The Collegeville Church History Time-Line an invaluable tool as they encounter numerous examples of change in the remarkable history of the Catholic church. Kelly examines how the Roman Catholic Church has not just survived but flourished though 2,000 years as it strives to make Jesus Christ a presence in the world. He focuses on how the church has developed historically and will continue to do so. 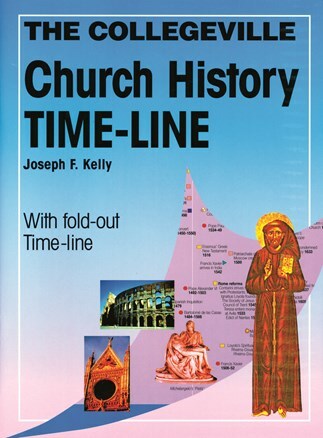 The time-line begins in the era of Jesus, leads through a history of Christianity including Constantine's conversion in the fourth-century, to the growth of the papacy in the twelfth-century, to Vatican II and the election of John F. Kennedy in the twentieth-century, and ends with the state of the church in the twenty-first century. Twenty-four pages of text explain the eras delineated on the time-line and provide fuller details regarding important people and events. Joseph F. Kelly, PhD, is professor of religious studies at John Carroll University in Cleveland, Ohio. He is the author of The World of the Early Christians, The Problem of Evil in the Western Tradition, Responding to Evil, and The Origins of Christmas published by Liturgical Press.
. . . a handy and accessible tool for those who wish to learn more about church history or who might profit from a visual approach to the panorama of events over time. Anyone seeking a short overview of the history of the Catholic Church should find Kelly's book extremely helpful. Perfect for the student in church history, or the high-school religion teacher, The Collegeville Church History Time-Line offers a solid, clear cut look at the development of the Catholic church from outpost to largest religion on the planet. This workbook size church history could prove very useful for high school or college students who are seeking an overview of the history of the Catholic Church through the centures. A tremendously practical handbook/guide to twenty-plus centuries of Christian Church history, with valuable four-color maps and images (including a unique time-line foldout), designed for the classroom and everyday reference. It is only 24 pages in length in a large format, but a work that scholars, teachers, students, and families would want to keep at hand for easy reference. Joseph Kelly, PhD, is Professor and chair of the Religious Studies Department at John Carroll University in Cleveland, Ohio. He and Liturgical Press are to be congratulated for producing such an innovative teaching volume in Church history.